Often called the tree of life, it is an increasingly popular organ for modern women to eat after childbirth, and some have made art with it. 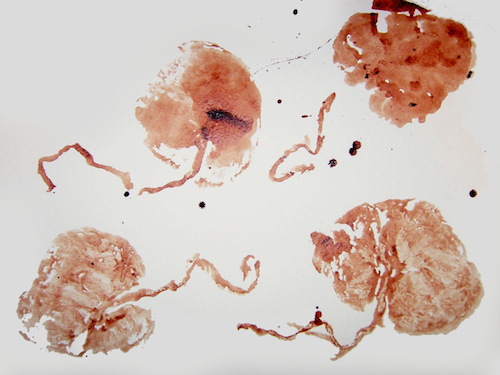 Pictured above is one mother’s Placenta Art. Following is a article Ozzie Ozkay-Villa wrote for Nourishing Our Children. Have you ever watched a dog or other family pet give birth? Yes it is exciting and cute and beautiful and all that fun stuff. And then, IT comes out … bloody, gooey red blob. Just when you thought it was over … they eat it! Yes, the placenta. The organ that nourishes your baby while he is in your womb. Some call it beautiful, some call it gross, some gag at the mere thought of it. If you ever get the chance to examine one- it’s actually quite fascinating; it looks like the tree of life! Above all, one thing is for certain, it plays a miraculous and vital part in growing a fetus. My name is Ozzie, I founded Alternative Mothers Group and am a birth and post-partum doula serving Marin County. Not only do I attend births but I also take home this amazing thing we call the Placenta, and bring it back to my clients in pill form all wrapped up in a pretty little bottle. Specifically, the placenta contains high levels of prostaglandin which stimulates involution (an inward curvature or penetration, or, a shrinking or return to a former size) of the uterus, in effect cleaning the uterus out. The placenta also contains small amounts of oxytocin which eases birth stress and causes the smooth muscles around the mammary cells to contract and eject milk. Read more about placentophagy. You have some options if you are considering eating your placenta. For any of these options you want to make sure you clean it really well before you ingest it. Wash off all blood, cut off the umbilical cord and get as much of the sac off as you can. It takes a particular personality to pull this off. As I said before, it’s not as popular, and if you are having a hospital birth, I can assure you they are not going to let you do this immediately after. If you are having a home birth, this is completely your decision. Often times a midwife may suggest it as an option to stop excessive postpartum bleeding, although she does come with other tools in her bags if this should ever happen to you. This can be done two ways – you can either cut off pieces of the placenta into tiny bits and swallow them (just like a pill). Or you can blend it into a smoothie. I would suggest using strong ingredients to cover the taste if you opt for the smoothie version. It’s been said by moms that have chosen the uncooked option that they experience an immediate rush of energy, so that’s pretty cool! Another option is to cook the placenta as you would any other piece of organ meat. You can pretty much do anything from stews, to pizza topping. Again, go for bold flavors and lots of spices. Since you’ll probably have a lot of whatever you cook (and since you’ll probably be eating it on your own) you might want to freeze some of it so that you can continue to take it should you feel down or anxious at all those first several weeks. I would suggest freezing it in smaller portions, as any other frozen food, you don’t want to pull it out of the freezer and re-freeze it afterward. This seems to be the more popular choice and is when you would call a “Placenta Processor” (or doula) to take care of this for you. It is something that you can do on your own but with the madness of a new baby at home – trust me it’s not worth your time or energy. It can be a very tedious and messy task and the equipment alone can cost about $200 which is close to what most Placenta Processors charge anyway. There are two methods to encapsulation. The first, more traditional, Chinese method is to steam the placenta, stovetop with a variety of healing herbs. You then slice it up and place it in a food dehydrator until it’s crispy, usually 8-10 hours (at this point you could also eat it like beef jerky). You then grind it up in a coffee grinder until it turns into a powdery consistency and put it into capsules that you can find at your local health food store. You can also buy a capsule filling machine but again, they can be pricey and it is still tedious nonetheless. The second method is to skip the steaming process altogether and go straight to slicing, dehydrating, grinding and encapsulating (this is also a “raw” option). This is usually done in addition to encapsulation as the tincture can last for years and years if stored in a dry dark place. It can be taken during times of sickness, PMS or high stress. To make the tincture, you blend a small chunk of the fresh placenta with some high quality vodka. Store in a mason jar for 6 weeks (give the jar a swirl every day). Strain off the placenta with some cheese cloth or an unbleached coffee filter. Not only that but it can also be given to baby in times of high stress or sickness. It is not rare anymore to hear from the most mainstream of mothers that she is choosing to encapsulate her placenta with her second child for fear of suffering from Postpartum Depression again. And, when you can get it in pill form – it doesn’t really even phase you! That said, this is a very personal decision and not everyone feels comfortable making this choice. There have been reports of mothers taking their placenta pills and feeling jittery and wired. As with all pregnancy, birthing and parenting decisions, it is important to remember we are all unique and what works for one mother, may not work for another. The best advice anyone can give you is to be open minded, do your research, then make an informed decision – whatever that decision may be. Ozzie Ozkay-Villa is founder and president of Alternative Mothers Group and works as a birth and postpartum doula serving Marin County. For more information, or if you are interested in Placenta Encapsulation please visit her website. Eating one’s placenta is not without controversy. Demanding that new mothers act like four legged animals is going way too far. Where do you land on the question – “to eat your placenta or not”? Have you done it? What has your experience been? 30 Responses to Would You Eat Your Placenta? I would absolutely eat my placenta! I would clean it and then put small amounts of it in a smoothie every day after the birth. I had my placenta encapsulated following the birth of our second daughter and believe it helped immensely with healing. The mw who did the encapsulation for me even came to the hospital to retrieve the placenta just hours after I gave birth, cooler and all! After reading the article written by the woman who regretted eating her placenta, I wonder if the negative side effects she experienced had to do w/ the herbs…my placenta was encapsulated by itself and I felt great while taking it. I would eat my placenta again and also recommend it to any other mothers who are considering it. Thanks, Jordan – good point about the herbs! It is hard to know what’s what in that case. I really really really want to do this next time around! Where can I find more information on having someone encapsulate it for me? I really struggled with nursing my girls and supplemented with homemade raw milk formula with both. I had a severe hemmrrhage with my first and dried up milk in 6 weeks. With my second I didn’t make enough for her until she was at least 2 months – I am so thankful for the recipe from WAPF! I wonder if taking my placenta would help replenish quicker and help with my milk production! HI renee – If its hard to find someone to encapsulate your placenta you can do it yourself- I did and its not very hard.. If I have another babe, I am definitely eating raw placenta!! You can eat it fresh for 2-3 days in the fridge (the way the author describes) and then freeze the rest into supplement sized pieces, so that you can swallow a capsule size bite each day right out of the freezer! I’m glad you all enjoyed my guest blog post. Renee, if you are in Marin I would be happy to provide this service for you. If you are not in the area, there is a great website, http://www.placentabenefits.info and you can find a specialist in your area! Thank you :) I live in Michigan – I will look up to see where I might find someone to help! This was a great blog post Ozzie! I ate mine after my second daughter’s birth. My incredible friend/doula Britt Fohrman cut it up for me to eat raw an hour or so after the birth and then she cut some up to add to smoothies which I did for the next several weeks. I felt incredible after birth and do believe that the placenta was a big piece of that. If I let myself think about what I was eating it did gross me out I admit, but if I just ate it quickly I was fine. I think encapsulation of placenta is another really great option and then it can be used at different times over the course of one’s life. I still have my two placentas sitting in the freezer! Great post! Thanks to Ozzie and to everyone for their comments. Deborah – did you see the 80 Facebook responses – open to the public: https://www.facebook.com/nourishingourchildren/posts/465845843425895! Quite robust – I am interesting to learn whether or not eating one’s placenta would be considered kosher and why or why not! I had home births with both of my children, and the placenta grossed me out both times. I didn’t even want to look at it. It ended up going into the ground with a tree for each of the kids. This is my biggest regret is regards to birthing. I wish I had known better. I wish that someone had challenged me to read up on the benefits of consuming the placenta. I struggle with acne, and as I learn more about my health and body and experiment with different things I am beginning to believe that the acne is hormone related. If I was able to attain someone else’s encapsulated placenta somehow, is this something that could potentially help balance my hormones? Hi Laura– its actually an “herb” in chinese herbal medicine and its called Zi He Che – I am not sure at this point if I would recommend it for you but maybe instead go and see a chinese herbalist/ acupuncturist and they can help you balance out your hormones . I want to hear more about how eating your placenta can reduce symptoms at menopause. The homeopathic remedy made from Placenta is very helpful as well, for many things: nausea of pregnancy, retained placenta, placenta previa, weak placenta, babies who have difficulty bonding and refuse breast milk, allergies (it helps detox on many levels, just like the organ), menstrual cramps…on an emotional level it can help one become more self aware. Credit/thanks to Melissa Assilem for her book on this remedy: Gifts of the Mother, The Matridonal Remedies; Idolatry Ink, 2009. Lypholized (freeze-dried) placenta (New Zealand Bovine tissue) represents one of the richest sources of nutrients and immune co-factors naturally present in biological tissue. Take 1-2 capsules daily before meals or as directed. I encapsulated my placenta after the birth of my first baby–or rather, my husband took care of encapsulating it for me! I realize not everyone’s significant other would be willing to take this on, but it actually proved pretty easy (and most assuredly did not cost $200– it total it cost $10 for the size 00 gelatin capsules. That’s it. He steamed it, dehydrated it in the oven, and ground it in the food processor). I was very grateful to have them during my postpartum healing–they significantly improved my mood, assuaged my anxieties, my pre-pregnancy acne never came back, and I have an excellent supply of milk (though I don’t assume this last benefit is entirely owing to the capsules). If you can pass the responsibility of preparation off to a devoted loved one, then mama has lots of time to heal, bond with the baby, and reap the benefits of placenta encapsulation. I have eaten my encapsulated placenta, twice – with both my children. First time, my partner prepared it, second time around we had the doula do the encapsulation. Really helped with ppd, and my milk supply has been great. I bought a capsule filling manual machine at our local natural food shop for $15. I’m all for a healthy, natural diet and doing whatever is best for my baby but seriously, eating something that is expelled from my body during childbirth is certainly where I draw the line. How is this not a form of cannibalism? So if you give birth to multiples and one twin or triplet tragically passes, should you just slice and dice him too? That’s what an “animal” would do. Same thing, right? Maybe you could even make a nice broth stock – that should last a long time in the freezer and is even Paleo! I think people take things too far. I am definitely open to eating my placenta, and I don’t think I would have to have it encapsulated to do so. Whenever I give birth again, I think I will try it and see how my body responds. I know when I started eating liver, my body started to crave it because I needed the nutrients. I think if my body needs my placenta, I will be drawn to eating it. Stacy I don’t think you understand why people are consuming their placenta. I personally am considering it because of how off my body and hormones are after birth. I don’t know what I’m capable of during ppd, and I don’t want to find out. If Something natural like this would be a refreshing safe solution, I’m in! Read more about the why, before you get so edgy and judge so harsh.